The State Fire Marshal’s Office encourages residents to turn their attention to fire prevention, as fire deaths across the state have increased this year—currently at 54 deaths compared to 55 total in 2016. Although the data is preliminary, the largest estimated jump in fire deaths this year is among adults age 65 and over—up 67 percent over the 15 deaths recorded for this age group this time, last year. Smoking and electrical related hazards are the leading reported causes of fire ignition attributed in these deaths. Understand that any situation involving fire hazards can quickly become deadly in a matter of seconds, regardless of a person’s age. Be vigilant of the fire risks in your home and take the necessary precautions to be fire safe. On every level of your home, including the basement. In the event of a fire, get out and stay out. Never go back into a burning home. Know at least two ways to get out of every room in your home. Replace smoke alarms that are over 10 years old with new alarms. Never smoke while you are lying down, drowsy, or in bed. When cooking, stand by your pan and watch what you heat. Make sure extension cords and wall sockets are not overloaded. 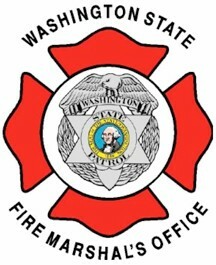 For more ways to be fire safe, visit the State Fire Marshal’s webpage at www.wsp.wa.gov/fire/firemars.htm.